Countertops can add tremendous impact to your home’s interior décor. At the same time, the manufacturing can have a negative impact on the environment. These days the countertop industry is teeming with creative products that offer Earth-friendly options without sacrificing style. There are several programs that certify the chain-of-custody of wood products. This ensures that the material was harvested from forests under a sustainable management program (i.e. no clear cut). One of the most widely recognized certification programs is through the Forest Stewardship Council (FSC). FSC is an international non-profit that has been improving forest management around the globe. The FSC seal means that a wood product was harvested from a forest that is sustainable, diverse and has socio-economic benefits. 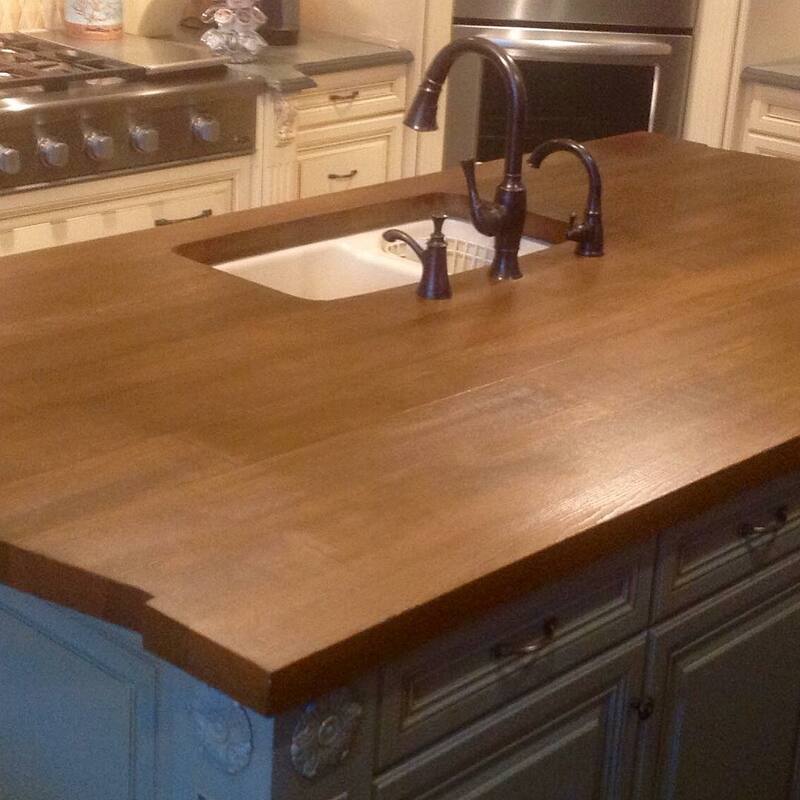 Wood countertops can also be made from reclaimed wood products. Reusing wood is even better than recycling because the material’s lifespan is extended. These products also have an inherit “aged” quality that makes them especially appealing to homeowners who desire a warm, timeless look. A nice green benefit to wood countertops is that they can be sealed with natural and low VOC products. Some manufacturers offer oils made from organic, lead free compounds like linseed oil. This finish is water resistant and enhances the wood’s natural beauty. Even some more durable finishes come in water based formulas that won’t affect the chemically sensitive. This type of countertop is one of my favorites. Terrazzo is durable, easy to clean and has a beautiful “depth” to the surface. It is available in a wide palate of choices; each of which can be quite colorful and decorative. What makes it green? Terrazzo is an aggregate of glass, stone and binders and several companies use high amounts of recycled glass, up to 100%. The recycled content diverts glass from landfills which is a tremendous load off the environment. Some terrazzo is made with concrete making the indoor applications extremely benign in regard to indoor air quality. The design flexibility that concrete offers has made it an increasingly popular choice as a finish material. No longer relegated to the basement, concrete is being recognized for a modern, clean look that can be aligned with green living strategies. As a countertop, concrete needs to be sealed but is then easy to clean and very durable. There’s no offgassing which means it is a good choice for addressing indoor air quality concerns, one of the US Green Building Council’s LEED categories. What makes it green? Cement has a high embodied energy meaning the manufacturing process requires a lot of input. However, fly ash can be substituted for cement and lower the energy required to produce concrete. So a concrete with 30% fly ash or more doesn’t contaminate indoor air and is completely recyclable. When it comes to “greenness”, paper composite countertops offer incredibly creative, earth friendly choices. With basic ingredients of paper and a resin binder, manufacturers of these beauties are using raw materials like shredded money, organic bamboo, cashew nut oil and beeswax. The appearance of paper composite countertops is warm and neutral. It can look similar to soapstone and be appropriate for a wide range of decorating tastes. Products are solid surface so they are easy to clean and highly durable. They often have a high heat resistance and some products are rated for commercial use. The most common complaint is that in lighter colors, these countertops can be affected by UV light. Still, the high recycled content, renewable material use and natural binders bring a lot to the table of eco-minded homeowners. The look is not for everybody but stainless steel provides a highly durable, very easy to clean surface that speaks to serious chefs and those with a clean line aesthetic. There are plenty of reasons that stainless steel is used in professional kitchens. It can handle hot pots, doesn’t stain and requires little maintenance. It’s nonporous surface limits bacteria growth and is easy to clean. How green is steel? Well that depends. It’s durable and recyclable so those qualities allow stainless steel countertops made from salvaged metal or with recycled metal. It can be installed without glue cutting down resource use and potential contaminants. Long life, recycled or reused content – these qualities make stainless steel a good green choice with little buyer’s remorse. Natural stone, like granite, is beautiful and durable but a finite resource. The quarry and mining of natural stone has a negative impact on ecosystems including water quality. Natural stone also eats a lot of energy in transport so it carries a heavy resource burden. Granite in particular has become the desired countertop in new construction and remodeling and many a homeowner longs to upgrade to natural stone. If you’re still stuck on granite try going as green as possible by searching for remnants and salvage. You’ll be surprised what materials are considered waste and you’ll be extending the lifespan of this precious material, which is a very earth friendly thing to do.